If you’re trying to find the right supplier of front doors to upgrade your entrance in Minneapolis, Minnesota, or any nearby community, then be sure to look closely at the selection offered by DuBois ABC Seamless. We have helped homeowners all across the Twin Cities region to upgrade their residences with quality, maintenance-free home-improvement products and services since 1980. All of the products we sell and install are extraordinarily durable and are guaranteed to last the life of your home. Legacy™ – This steel entrance door provides unparalleled security in either a smooth or wood-like finish, with deep shadow lines that accentuate the beauty and character of the door’s design. 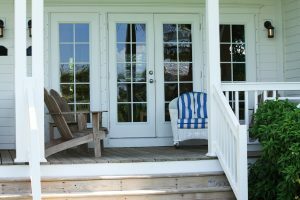 Heritage™ – These exterior doors provide the strength and security of fiberglass, with the look and feel of real wood, and are painted with a resilient finish that will look great for many years to come. Embarq™ – This fiberglass door is 43 percent thicker than most front doors, and is the most energy-efficient door available in the U.S.
Signet® – With an incredibly realistic representation of real wood, despite being made of fiberglass, this door style features dovetailed hardwood stiles and rails for an integrated frame that offers unmatched strength and durability. To learn more about the various styles of front doors we offer for homeowners living in Minneapolis, MN, or any other community in the Twin Cities area, contact DuBois ABC Seamless today.